Dagsmosse Mire is the spring-fed mire in which the Alvastra pile dwelling is situated. When the news reached us that the Swedish Foundation for Humanities and Social Sciences had granted the Alvastra pile dwelling project funding, I immediately proceeded to our storerooms out of town in search of an iconic artifact to illustrate the press release that the communications department was planning. The picture shows what I found after a short perusal of some of the material from the 1976-1980 excavations at the site. It is a bead of antler/bone in the shape of a double-edged axe. It was found in the Middle Trench excavated during the 1976-80 investigations. Its two halves were found in two different adjacent excavation squares. No new suspension holes were made in the two new halves. The fractured surface seems to have the same patina as the rest of the bead which may suggest that the fracture is old, i.e. that the bead was broken in half before it was deposited. The two halves do however fit together. The Middle Trench is in the western part of the Alvastra platform. I chose this object because it is iconic in two ways. It forms a link with the older excavation of 1909 – 1930 conducted by Otto Frödin. A bead of the same shape was found at these excavations. 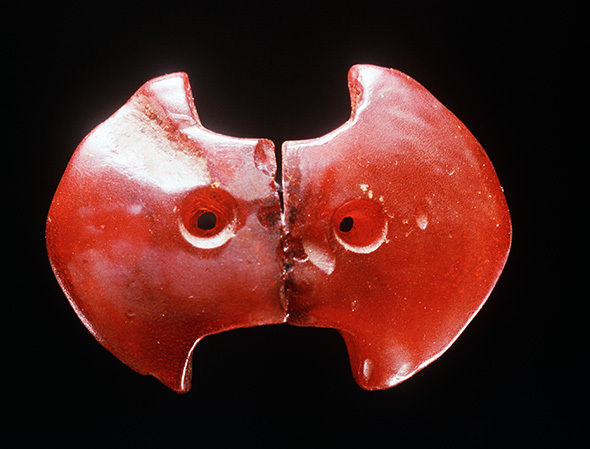 The bead from the older excavations also seems to have been found split into two fitting halves. 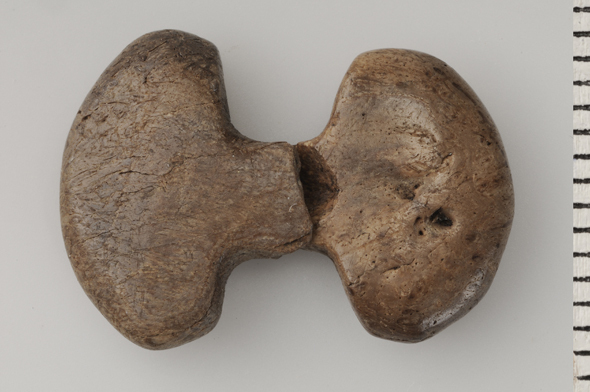 The break must have predated deposition because, in contrast to the bone/antler bead, each half has been provided with a new suspension hole. The older find also differs in that it is made of amber and it was found in the eastern section of the Alvastra platform. Two more amber bead halves were found in the causeway area of the platform during Frödin’s excavations. Amber beads of this shape occur in megalithic and some pitted ware graves. They also occur in Neolithic hoards. I have not yet made a search of the relevant literature but off hand I do not know of any bone/antler beads of this shape. This bead is also iconic in that it is one of several symbols of duality in the pile dwelling. In his book on the prehistory of Alvastra Hans Browall has listed both the construction of the wooden platform with its two departments and the other artifacts which seem to bear connotations of duality – the double-edged axes of stone and the carbonized apples which are often split in half. One interpretation is that these symbols of duality have something to do with the two archaeological cultures represented in the pile dwelling – the Funnel-beaker and the Pitted Ware cultures. Accession number SHM 13929:G11,33. The bead is 39 mm long and 27 mm wide. Browall, H., 2003. Det forntida Alvastra. Statens historiska museum. Stockholm.